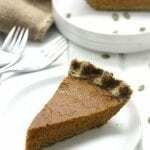 Paleo Pumpkin Pie in a Pumpkin Seed Crust plus a full Paleo Thanksgiving Dinner Menu that includes everything besides the turkey! To say that I am excited for Thanksgiving this year would be the understatement of the century. As a born and bred Canadian, my experience with American Thanksgiving has been limited to only a few occasions, but let me tell you, it was love at first bite. This year, I’ll be celebrating with C’s family in SF. Preparations include, reading the low-down email I received at least 3 times a day, brainstorming what I plan to contribute (this post is helping!) and making plans to pack my second stomach. Thanksgiving is meant to be enjoyed and not stressed over. The likelihood of you overindulging is pretty high so don’t beat yourself up over it. Try throwing in some healthier options if you can or even this full Healthy Thanksgiving Dinner Menu if you and the fam are up for it. More importantly, focus on giving thanks to the people you love over a delicious meal. Let’s get to the menu! Finally my recipe! I’ve been meaning to make this pie since last year but somehow I never got around to it. This round-up was the perfect opportunity for me to test my pie skills aka master the pumpkin seed crust. I thought it would take me several attempts to get it, but the pie gods were on my side and it turned out amazing on the first try. 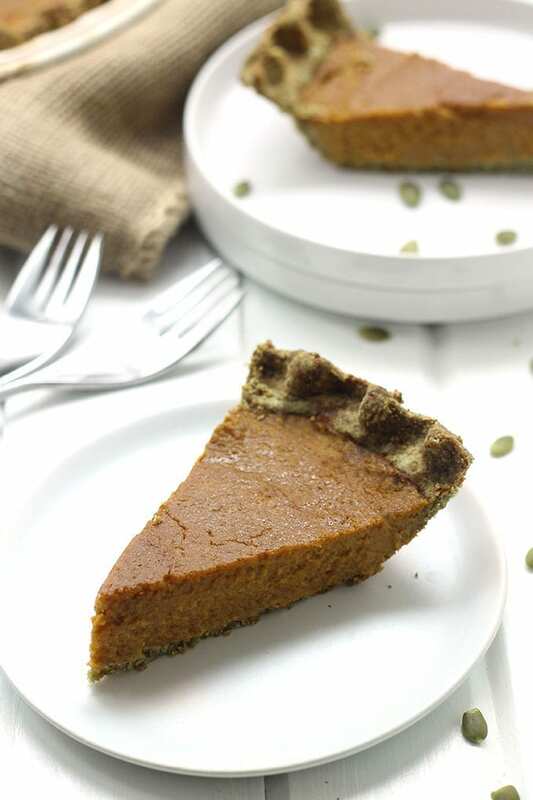 This Paleo Pumpkin Pie is dairy-free, grain-free and has zero refined sugar! It requires a bit of patience, but it is absolutely worth it. In a bowl combine ground pumpkin seeds, baking powder, xanthan gum, tapioca starch, coconut palm sugar and sea salt. Add in coconut oil and either cut in using a pastry cutter or mix with hands. Should create pea-sized clumps in dough (don’t overmix). Slowly incorporate egg white and continue stirring until dough can come together into a ball. Mix together pumpkin puree, coconut oil and almond milk. Pour the filling into the crust and smooth out top with a spatula. Cover and place in refrigerator to set for another 2 hours. Do not try eating before cooling as pie will fall apart. *I use this non-stick roller with the parchment paper and I love it! **to form scalloped edges follow this tutorial or use this pie plate. ***check out this pie crust shield which is all kinds of awesome! What are some of your favourite Thanksgiving dishes? Have you ever tried to healthify some of them? Haha Yep! I hear you! I was excited for thanksgiving when I first started coming over here….actually, what am I talking about? I still am 😛 Especially this year as I get to cook from home…so I get to be in charge….and we know we love to be in charge hehe! I am sure you will have a great time with Cs family. 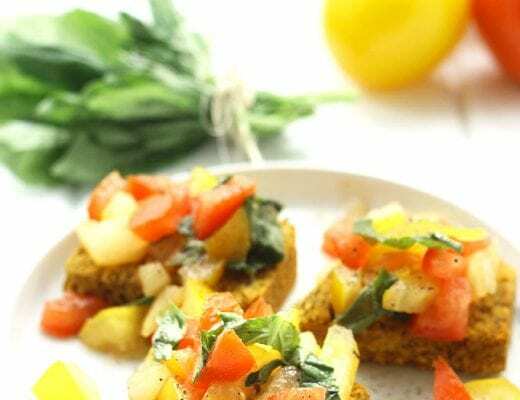 Great ideas for healthy recipes. I shall pin this right now! Thanks, lady!!! I’m totally on board with US T-giving. Probably my fav thing about the country 🙂 So fun you get to be in charge this year!! Thanksgiving is probably my favorite holiday. I’m so glad you’ll get to celebrate it American style this year! And in SF no less!! That’s one of my favorite cities. Basically I’m jealous. Although I’ll be in Louisiana, where it’ll probably be 75 degrees and wonderful…so maybe you should be jealous! Next year?! Awaiting my invite 😉 MISS YOU!!! So glad you approve of my first time addition girl! Thanks for having me…and I feel the same about your pie! I can’t wait to get my face plant on!! Pinned! Hello Thanksgiving! This pie needs to be recreated. Thanks for the inspiration! anytime, lady! Cannot wait for T-giving to get here! I love the pumpkin pie, but I really, really want those brussels sprouts! I’m on a kick lately. You’re going to have so much fun in SF! eeeee I can’t wait! The brussels were so GOOD. Lee made me bacon like 3 times in 48 hours a few weeks ago. The girl knows her stuff! Since we don’t do Thanksgiving, I definitely don’t have to wait! I am SO intrigued by these brussels sprouts – since I am not a bacon fan, I guess I try them with smoked spanish ham. Thanksgiving is my favorite! Your guy’s dinner is a little lacking on cranberry sauce (my thanksgiving addiction) but everything else looks so good I think I can forgive you 🙂 I’ve been looking for a GF dessert option for this year and this pie just moved to the top of the list. I’m going to be sad when Thanksgiving rolls around and I’m going to have to remind myself that I had Thanksgiving like 6 weeks before. Boo. Thanksgiving favourites: my cousin’s deviled eggs (that come out at every holiday/family gathering) and pumpkin pie. But then you can look out at the Mountains and realize you wouldn’t want to be in the US for Thanksgiving anyway 😉 Sending you lots of love!!! Funny, just last night I asked Chris how he felt about having a non-traditional Thanksgiving dinner this year. I’m thinking that we might do smoked brisket instead of the traditional turkey. I do want to try those bacon wrapped brussels sprouts though. SMOKED BRISKET IS MY FAV!!!! More than turkey! Ah can I get an invite?! I LOVE green bean casserole!!! You are not alone!!! I want those bacon wrapped Brussels sprouts!! Same here! My Mom throws a US thanksgiving party every year (to which I am not invited but expected to cook for…don’t ask) and every year I lower the sugar in every dessert I bake. No one needs to know! Those brussel sprouts, oh man. My family got lazy on the whole turkey thing, and so now for Thanksgiving we just end up making all our favorite side dishes. I might have to make those. But my mom makes some mean sweet potato dishes. You’ll have a blast in SF for Thanksgiving. Good weather, good food, good people. YUM! 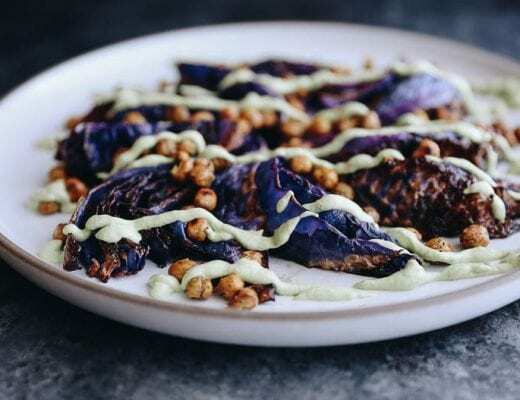 I have been totally waiting for this recipe to be posted! 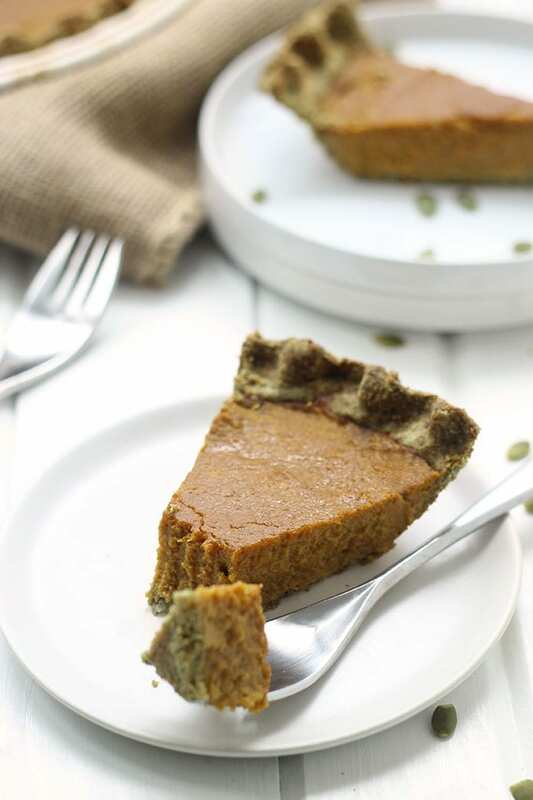 That pumpkin seed crust sounds like a GENIUS idea! Will give this a try soon! You’re coming to SF?? That’s just 15 minutes away from me! I totally health-ified basically everything my grandmother cooks last year… green beans almondine, pumpkin pie, corn bread (well, she never makes that but healthier than rolls). So sad I’m missing Thanksgiving but can’t wait to spend even more time with you in SF!!! 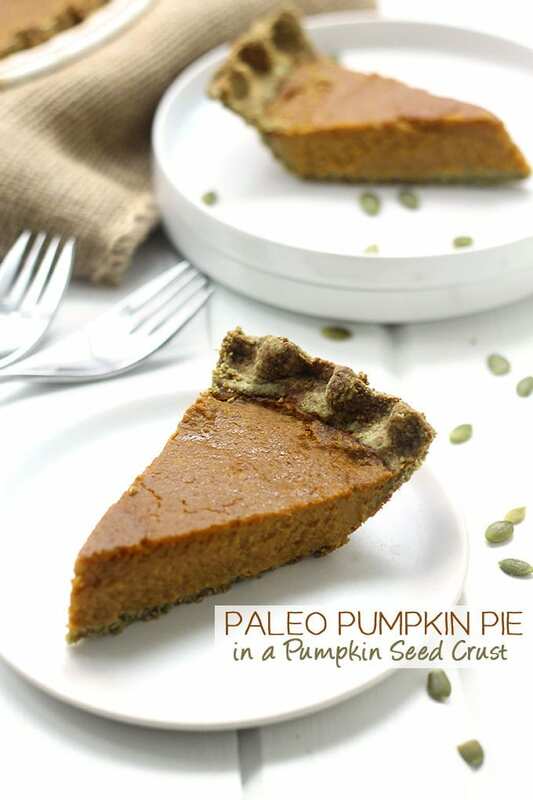 I’ve made paleo pumpkin pie before but never with a pumpkin seed crust. This looks amazing! Thanks lady! I’m excited to celebrate two Thanksgivings this year just for the pumpkin pie! I can hardly handle all this beauty!!!! Seriously crushing on that pie. I my just have to make it for the fam and say it’s full of gluten and allllll the sugar so they’ll eat it. Obsessed!! yeahhhhhh I’m wondering how this will go over on Thanksgiving…. Love this menu you guys came up with! But as a pumpkin pie lover, your recipe in particular calls out to me. It looks amazing! And I love the idea for a pumpkin seed crust. My family would probably try to shoot me if I ever tried to healthify our Thanksgiving dinner haha. My favourite dishes are the pumpkin pie (duh), cheesy baked cauliflower, and my dad’s stuffing that I’m pretty sure is made with a whole pound of butter lol. If it makes you feel any better, my Mom (hi Mom!) 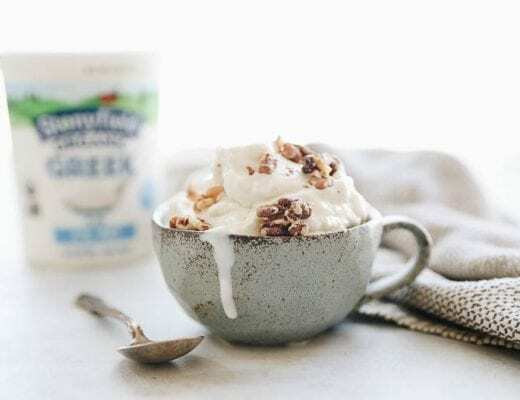 totally stalked the comments of this post and saw that I mentioned lowering the sugar in her T-giving dessert recipe for this year and promptly emailed me telling me to not dare attempt trying that lol. So yeah, healthy and thanksgiving don’t go hand in hand in my fam! That pie looks amazing and I love the variety of the recipes on the list! Oh HECK yes. 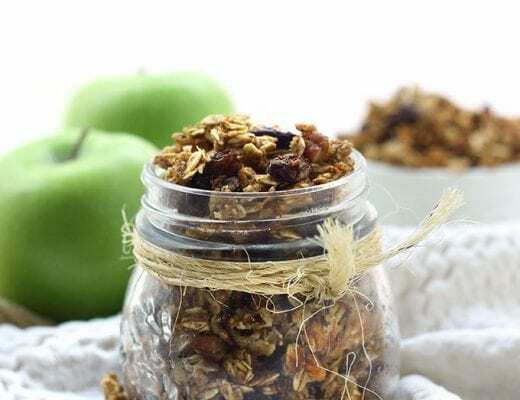 Pumpkin seed crust? Genius. I’m also just a weeeee bit jealous that you’ll be spending Thanksgiving in SF— one of my favorite cities ever!!! I tried healthifying stuffing a couple years ago by making a quinoa stuffing…but I was just sad. I love quinoa and all, but stuffing just needs bread. I will never commit that Thanksgiving crime ever again. This crust is genius!! We eat pumpkin pie at Christmas, too (I know, we’re weird) so I am going to have to make this!! the kiwi actually doesn’t like Thanksgiving. Too american he says. haha. But i bet he’d love that bacon and brussels! It’s funny cause I LOVE T-giving because it is so American. Canadian Thanksgiving is just so mehhhhh!